Students participating in Skoltech’s 2018 Innovation Workshop have come from all over the world to study at the institute. From Russia to Asia, to South America and beyond, these talented future entrepreneurs, researchers and engineers are working towards their master’s degrees – and benefitting from the workshop experience. 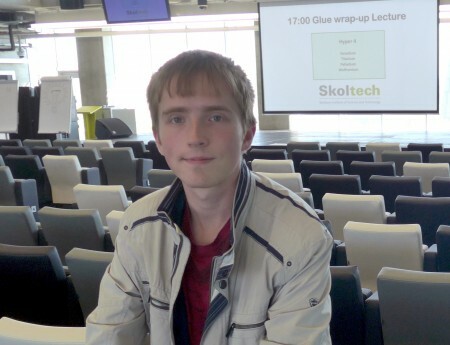 On his choice to study at Skoltech, Alexey Fedoseev says it was important to join a university that works with research projects with a potential for future development. He previously worked with research projects that did not have future development potential, so Skoltech stood out as a different place. Fedoseev learned of Skoltech from the media and colleagues and was impressed from his first campus visit. On the Space and Engineering Systems track for his master’s degree, Fedoseev has been teamed for the Innovation Workshop’s innovation project with students from Photonics and Quantum Materials, Data Science and Life Sciences departments. He thinks it could help them all develop better communication skills and the ability to work productively with people they’ve just met – proficiencies they are likely to use in their careers. A second-year master’s student, Tanvir Ahmed from Bangladesh believes the Innovation Workshop provides many opportunities for students to learn. 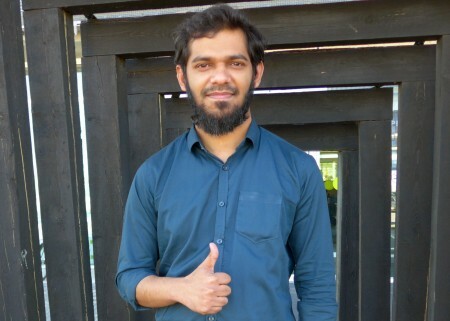 Tanvir Ahmed comes to Skoltech from Bangladesh, where he received a bachelor’s degree in electrical engineering at the Islamic University of Technology. He is starting his second year on the Energy Systems track at Skoltech and participating in the Innovation Workshop now, as he was unable to be in Moscow for the start of last year’s event. Still unsure of his career plans, Ahmed wants to continue working in research and is considering enrolling in a Ph.D. program; he would like to eventually return to Bangladesh and share his international academic experience with others. Ahmed says there are many opportunities to learn during the Innovation Workshop, especially in terms of collaborating within a cross-disciplinary team and using its members’ varying backgrounds for success. Working with international mentors – as well as professors from Skoltech’s Center for Entrepreneurship and Innovation (which organized the Innovation Workshop) – also helps students to understand business modeling and the startup culture, he added. 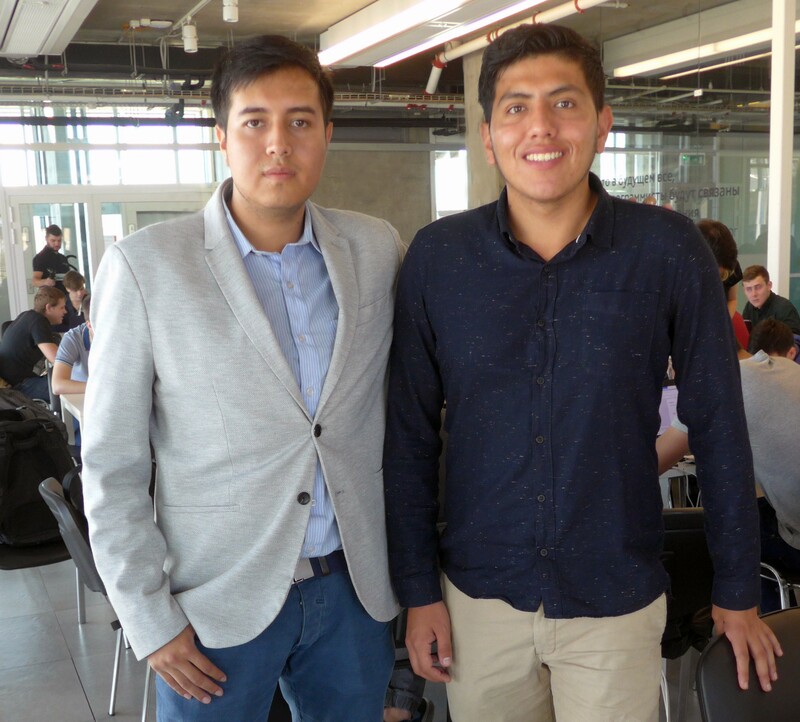 Jonathan Tirado, left, and Juan Esteban Heredia Mena are from Ecuador, where they studied at the National Polytechnic University. Jonathan Tirado and Juan Esteban Heredia Mena are both first-year master’s students from Ecuador. The two studied electronic and control engineering at the National Polytechnic University; at Skoltech, Tirado is on the Energy Systems track, while Heredia Mena currently studies in the Space and Engineering Systems department. Both are pleased their Skoltech experience and the challenges posed during the Innovation Workshop. Tirado did not expect the program to last so long, thinking it would only take a few days, but he appreciates the four-week opportunity to build connections and share ideas with mentors, as well as receiving their feedback. “It’s important to learn how to express your thoughts and how to share them with others,” he explains.